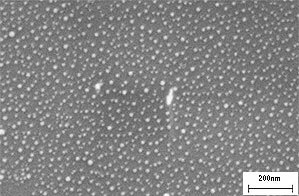 The gold particles are uniformly deposited on a smooth 5x5mm silicon chip with a thickness of 0.5mm (#16008), unmounted or provided on an SEM specimen mount. This AuSome™ resolution and calibration standard comprises a silicon substrate configured with two discreet populations of large and small gold particles. The larger (117.3nm, STDV 8.4nm) population of gold particles go from individual particles all the way up to large aggregates. These islands of aggregated particles can cover micron sized areas. 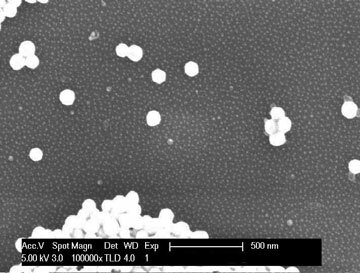 The large aggregates provide reference points that are easy to focus on at low magnification; thus making the smaller (27.3nm, STDV 6.3nm) particles easy to find. 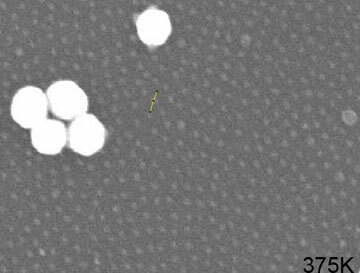 The small clusters of 117.3nm gold particles provide the sites to check resolution and calibration in the submicron range. The small 27.3nm gold particles represent the AuSome™ coating on the silicon substrate to provide high magnification resolution check. AuSome™ provides a continuous monolayer of gold nanoparticles with uniform particle size and inter-particles spacing over the majority of the substrate with a higher density at the edges and corner.